Get the best from your Canon PIXMA inkjet printer and produce stunning full colour photos by installing genuine CLI-8 photo colour cartridges. 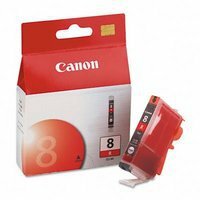 This Canon 8 Red Inkjet Cartridge uses Canon FINE (Full Photolithographic Inkjet Nozzle Engineering) print heads for incredible crispness and detail. These printheads, combined with uniquely formulated Canon ink, provide exceptionally long-lasting prints under the Canon ChromaLife 100 system.